We can offer 2 hour fun filled sessions during the week days and Saturday mornings. This encourages children to learn about the care and feeding of their ponies and how to groom, tack up, putting on rugs and a variety of other topics. 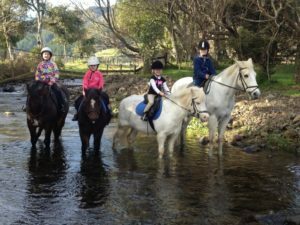 They also ride for around 1 hour and do a variety of things including lessons, jumping, games and farm rides. 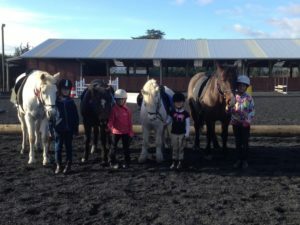 Children do need to be able to ride off the lunge rein, so may need some individual lessons before being able to join the pony club group. This is run as a 10 week term.